A guided tour to the setting of Demon’s Fall, a city home to demons and the soulless, where everything is for sale — even an angel. Just as ports are built because they serve as points of access between land and sea, Hellsgate is the city between Hell and the mortal realm. Hell is so inhospitable — so utterly boring and under the iron control of the Princes of Hell — that many demons don’t care to stay there. The mortal realm, however, is full of humans who tend to panic at the sight of demons or constantly try to exhort foolish bargains. This grew tiresome, so a city was established at the gate to Hell where all demonkind is welcome, and today it’s a bustling center of trade, full of both demons and understanding mortals. The majority of the population consists of demons of all breeds, from the human-shaped succubi (and their male counterparts, incubi) to animal familiars, from pyromaniac ifrit to swift-hooved demon-horses (who can serve as paid transportation). Even mirror-demons, who can have one side in the mortal realm and the other in Hell, have established their own residence, the Hall of Mirrors. A rough hierarchy of demons does exist, determined by how powerful each breed is and somewhat mitigated by an individual’s personal influence. All bets are off when the Princes of Hell are in town, but thankfully, they rarely make an appearance outside of Hell. Mortals tend to dwell in their own quarter of the city. There are generally two types of humans who live in Hellsgate: the soulless and entrepreneurs. While dwelling in the mortal realm, demons have common needs such as food and clothing, and these are often provided by humans who have set up shop. The soulless have succumbed to a demon, and in their deprived state have made it to Hellsgate in hopes of intercepting their tempters and recovering their souls. Few succeed. The marketplace is a must-go. From Hellfire-forged weaponry to freshly baked pies, long-hooded cloaks for less comely demons and jars of sticky sin for those wanting to ward off the holy — you can buy anything you need here. Most merchants are open to bargaining, so don’t fall for the first named price, no matter how much they insist it’s an amazing deal. The actual gate to Hell after which the city is named lies a short distance away. Not recommended for the casual tourist. Although locked to outsiders, the aforementioned Hall of Mirrors is still a stunningly reflective piece of architecture that can be appreciated by daytime passersby. It’s also a recommended destination for those pursued by a gorgon. Holy water, holy seals, and any other blessed objects are strictly forbidden. Their confiscation is problematic, however, considering that no demon or sinful mortal can bear to touch them. Although mortal businessfolk will accept mundane silver coins, any dealings with demons will require payment in souls. Authentic soul currency will appear to be a gold coin, with the soul’s ex-possessor’s visage stamped on one side and his or her true name etched upon the other. Some souls come from humans with a more refined pedigree, and these are considered to be of a higher denomination. Mortal visitors, if they fail to bring appropriate coinage, may attempt to sell their own souls, but only minor imps are likely to be interested; more powerful demons prefer the game of tempting or tricking a reluctant human. Also, soullessness is a known state of misery, and promises an afterlife in Hell — the place so unpleasant, you may recall, that even demons avoid it. Now…how would you like to pay for today’s tour? One of the few things I remember from the glorious haze surrounding my memory of the acquisition call is the editor’s comment that the story had an unusual setting. 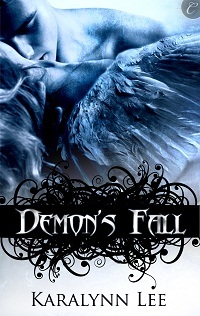 So I’ve shared the world of Demon’s Fall with you here — you can read more about the book, including an excerpt, by clicking on the title. Now I’d love to hear about cool, unique settings you enjoyed in other books. Karalynn Lee spent her childhood in a foreign city, Seoul, where she encountered no demons except for reckless taxi drivers. Find out more about her or read more of her writing at karalynnlee.com. Thanks for the tour Karalynn! Love the sound of this and now I can’t get the image out of my head of a little shop just down the street from hell with a freshly baked pie cooling at the window. Thanks, Eleri! I mean, I figure that the heat from being close to Hell has to at least be good for baking, right? Thanks for dropping by and seeing the sights, Angie! Wow–this is an amazing post, and even more amazing world-building. I love the details you envisioned and how the inhabitants get along there. I’m off to explore the book link. Thanks! And Amy, glad you enjoyed your look at the world! I have high hopes the story will intrigue you as well. Copyright © 2000 - 2019 Harlequin Enterprises Limited *All right reserved. | ® and ™ are trademarks owned and used by the trademark owner and/or its licensee. Subscribe to the Carina Press Newsletter & Save 20% on Your Next Order! Sign up to receive newsletters, special offers and other promotional emails from Carina Press* to get the inside scoop on all our new books! *Harlequin Enterprises Limited (Carina Press) is located at Bay Adelaide Centre, East Tower, 22 Adelaide Street West, 41st Floor, Toronto, Ontario, Canada M5H 4E3 and sends informational and promotional emails on behalf of itself and Harlequin Digital Sales Corporation. Subscribers can unsubscribe at any time.